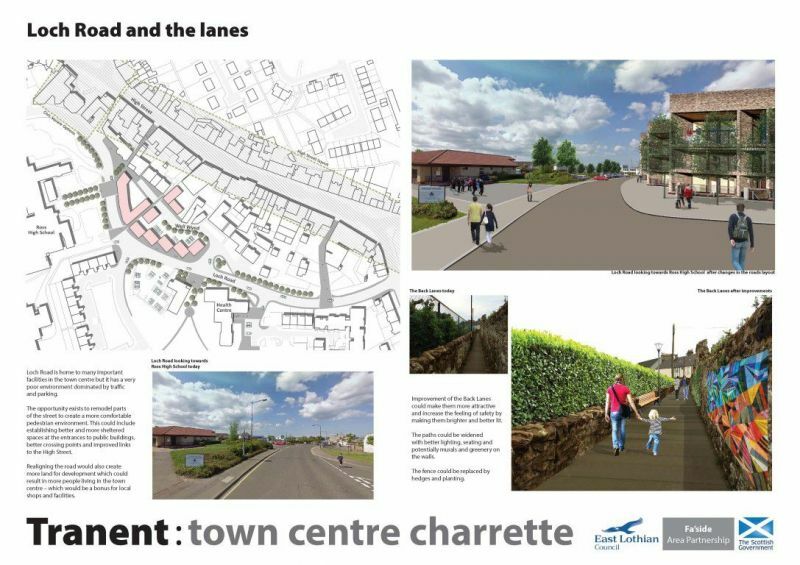 The Tranent Town Centre Charrette was a 3-day intensive design event held between 26 and 28 March 2015 with a follow up launch event on 30 April. 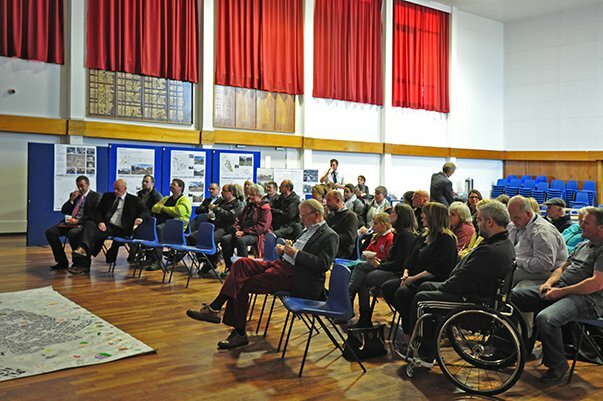 East Lothian Council and the Fa’side Area Partnership commissioned the charrette, following a successful application to the Scottish Government for charrette mainstreaming funding. 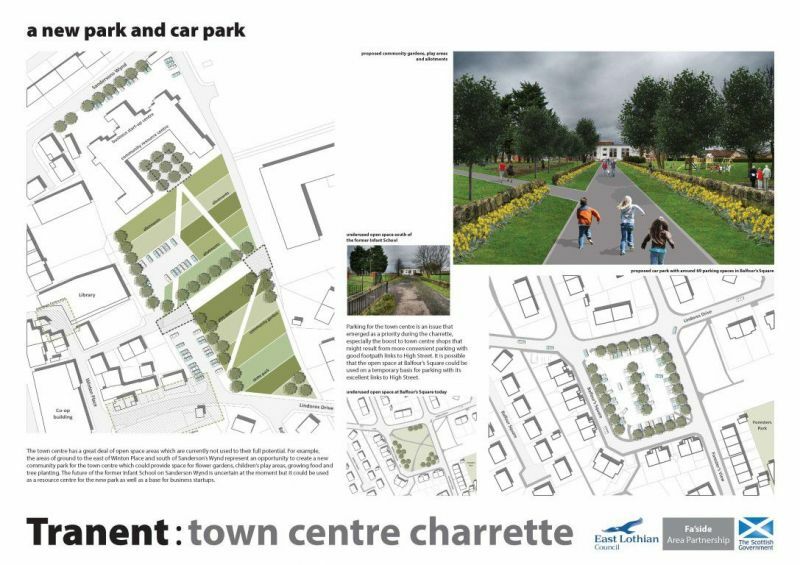 The team appointed to run the charrette was led by Kevin Murray Associates and included Willie Miller Urban Design, Peter Brett Associates and icecream architecture. 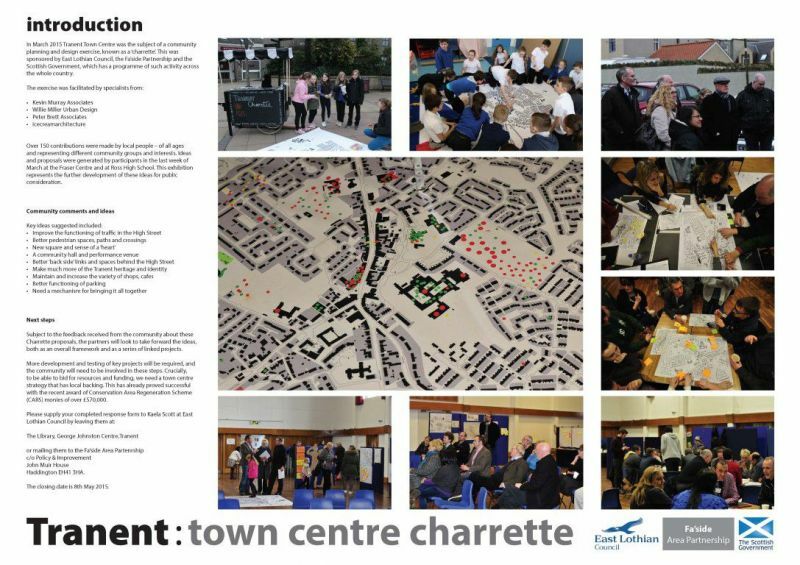 Local stakeholders and agencies, local businesses, residents and groups attended the charrette. Prior to the events taking place, conversations were initiated locally through visits from the charrette team to Tranent, social media campaign and a 48 hour pre-charrette intensive visit organised by icecream architecture. The purpose of this pre-charrette stage was to raise the profile of the event and its purpose (often in the first instance answering “what is a charrette?”) and to continue developing the baseline of local issues and ideas. 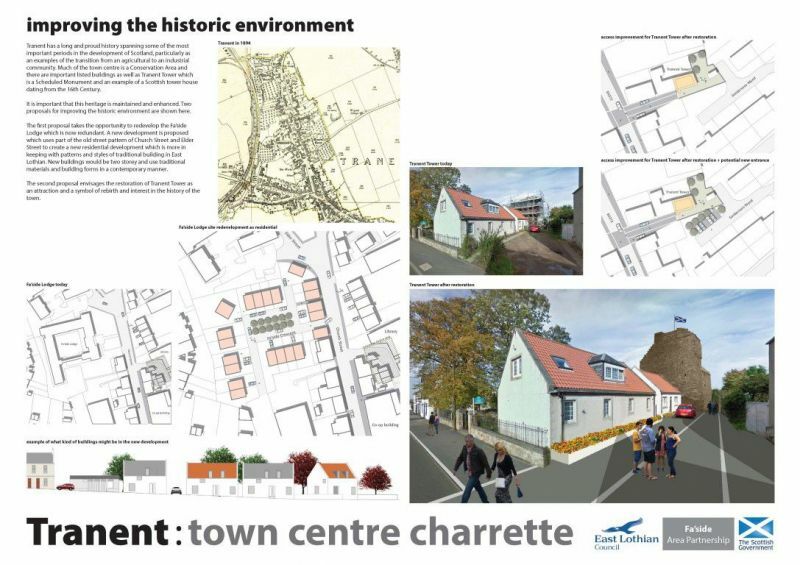 The charrette event itself began on 26 March with a welcome and introductory presentations and a site visit, in order to bring all those in attendance to the same base-level of understanding and to begin to share local knowledge and perceptions of the area. The team used the initial discussions from the site visit to work through future scenario exercises and more detailed place studies with attendees. 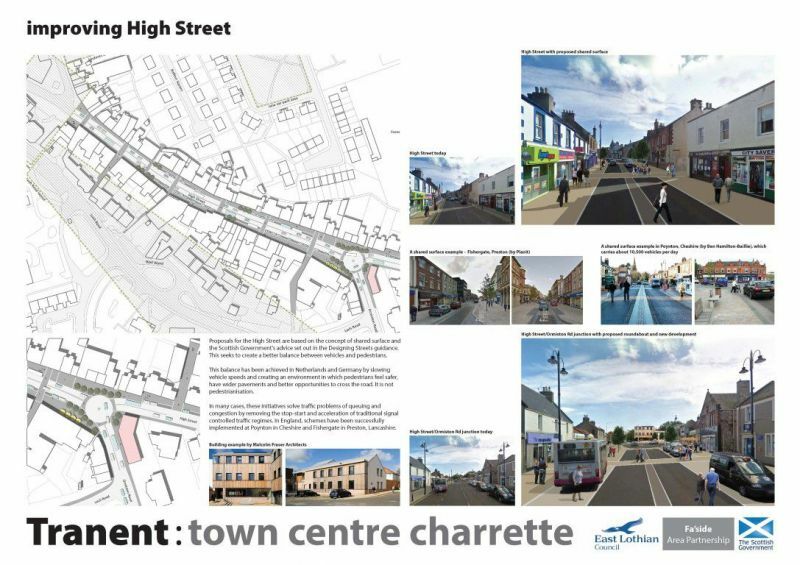 The evening session created a further opportunity for involvement and input to the charrette, with a good turnout from the local community, including the Recharge Youth Group who play an important role in the town centre. Review and design were the primary activities of the second day of the charrette, with input from specialist East Lothian Council officers and an open design studio in the early afternoon. 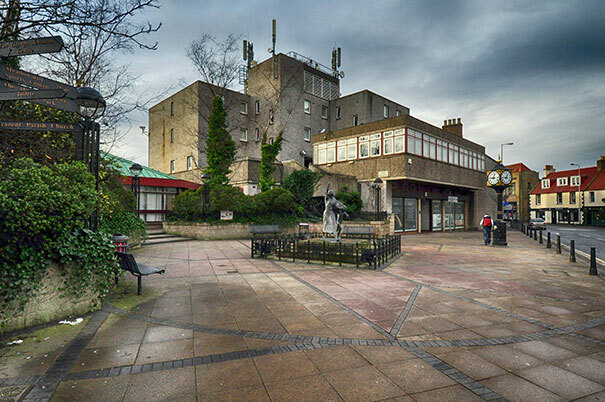 The time was used by the team to develop the framework for Tranent town centre and areas of detail, in particular the focus areas of Civic Square, High Street and Fa’side Lodge. The design work was curated into an exhibition for the final morning. The final day’s format was a drop-in exhibition of the ideas generated, closing the event with a more formal presentation and discussion of the outputs. 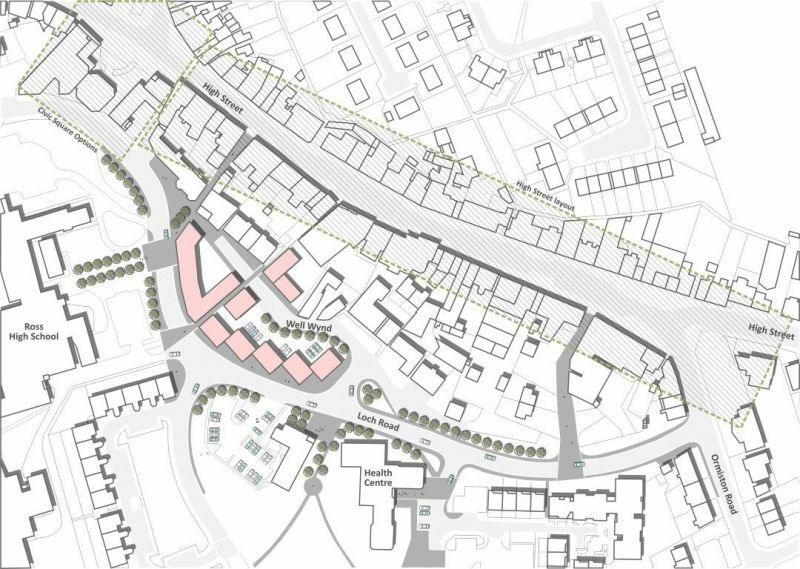 traffic flow and volume acts as a constraint on movement through the town, but also on the quality of environment that the town centre can offer to local businesses and people who are using them, and the quality of centrally located public spaces. enhancing the pedestrian experience would serve to better connect the town centre to other parts of Tranent, particularly the areas immediately north and south of High Street which have got a number of good facilities – crossing High Street can be difficult in parts when traffic is busy and improving this would improve the safety of the street and aid movement. Tranent is a local hub, yet lacks its own community hall that can accommodate different groups, performances and other events. Tranent has a very good network of lanes and smaller pedestrian links. However, the quality and lack of sense of safety means that these are not used as well as they could be. Upgrading these areas would better connect lots of areas, and also enhance one of the unique and ‘fun’ aspects of Tranent, discovering the lanes and routes that can be taken on them. Tranent has a distinctive heritage, in particular the transition from an agricultural to an industrial place. Its coal-mining legacy is alive in many residents today who either worked the mines themselves, or their families did. This close connection creates an opportunity to make more of the town’s heritage and to explore it further, back to Tranent Tower and the role that this may have played in the area. 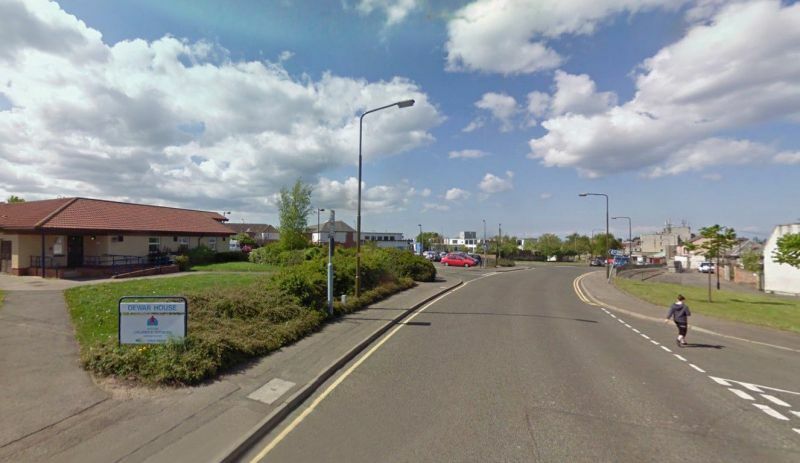 Tranent is fairing better than many Scottish towns of comparable size and proximity to large urban areas, however it still has a lack of variety on High Street with many bookmakers and takeaway shops. Many felt there was scope for a greater variety to cater for local people without them having to travel to Edinburgh to purchase clothes and shoes, an often-cited example during the charrette. Parking is an issue in Tranent, with much discussion on whether this is from under-provision of parking or the wrong parking in the wrong place with the wrong regime. A new management regime that discouraged long-stay parking and encouraged higher turnover would create space for people who were using the shops and facilities in the town centre. In addition to this signage to let people know where there was available parking behind the High Street, with improved pedestrian links from these parking areas would be beneficial. A mechanism to draw all of these elements together. The community facing elements would need a mechanism to pull together the many facets of the plan to regenerate Tranent town centre. In particular this relates to the development of a community hall, which would need a vehicle that was able to bid for and capture funding. The plan is principally about the sum of multiple small to medium scale improvements that will have a greater impact than a single ‘big ticket’ redevelopment could. 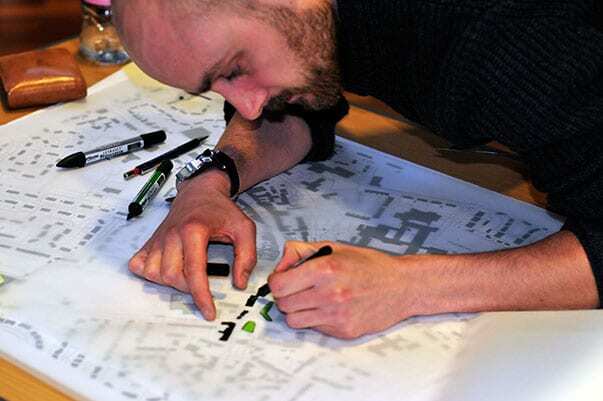 The outputs from the main charrette event were further refined for a follow-up event on 30 April. These were divided into thematic or geographic projects, with an overarching framework to tie all of the elements together to deliver on the strategic vision above. 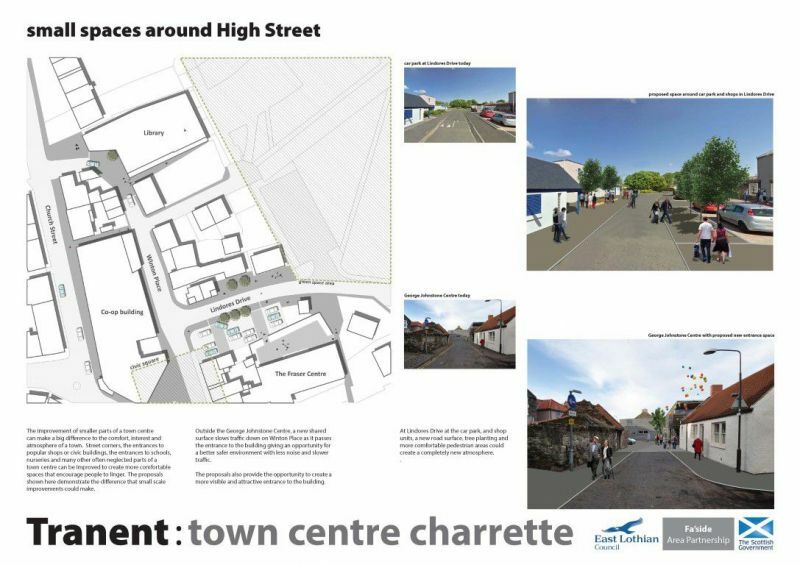 An analysis of the options that were brought forward at the charrette including options for the former library buildings. The implications of traffic reduction measures beyond the town centre must also be considered in the analysis of the civic square options. 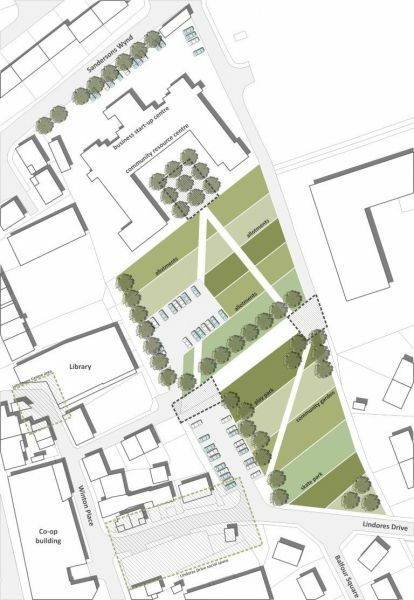 Key to all of the options is the development and redevelopment of buildings in the area with active and accessible ground floors that will animate and enliven the area. 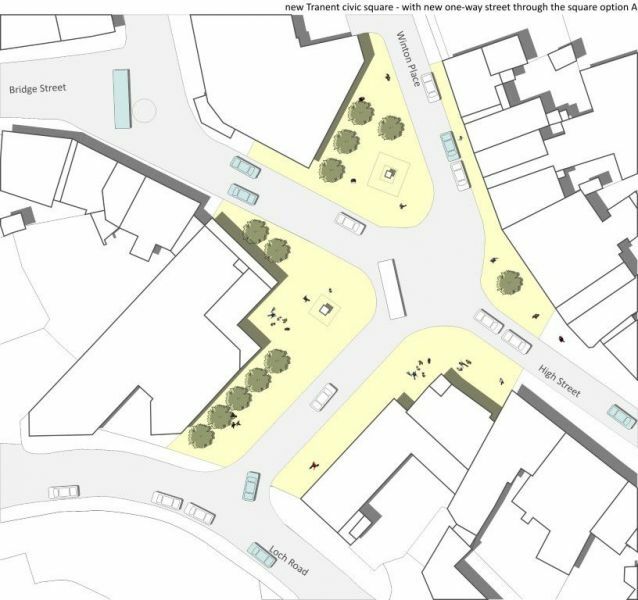 The recommended approach for High Street is based on shared space concepts that modify driver behaviour allowing pedestrians to be in greater control of the town centre environment. This begins with vehicle attenuation zones at either end of High Street that physically signal to drivers that they are entering an area with a different set of ‘rules’. Vehicle lanes are narrowed through widening the pavements and introducing a median strip, again to slow down drivers. Benefits to pedestrians include crossing points that are pedestrian priority areas that have been aligned with desire line routes from the areas to the north and south of High Street. Wider pavements create more space and freedom for movement. Benefits for town centre business are that this retains traffic and parking (although this may be slightly reduced), improving the pedestrian environment encouraging people to spend more time in the town centre and wider pavements creating the opportunity for outdoor seating or displays. 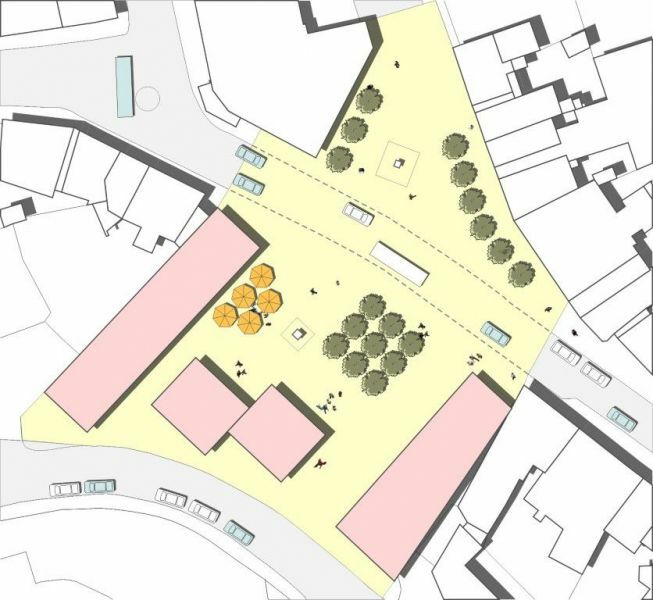 There are a number of smaller spaces in the town centre, particularly around key buildings, that could be improved to tie together High Street and the numerous civic assets to the north and south of the main street. Creating social spaces enhances access to these facilities, creates an opportunity to bring activity from inside these venues outside and signals that these are significant places within the town centre. There are a number of key facilities and buildings on Loch Road that appear to exist and function separately from the town centre in spite of the proximity between these and the main street. 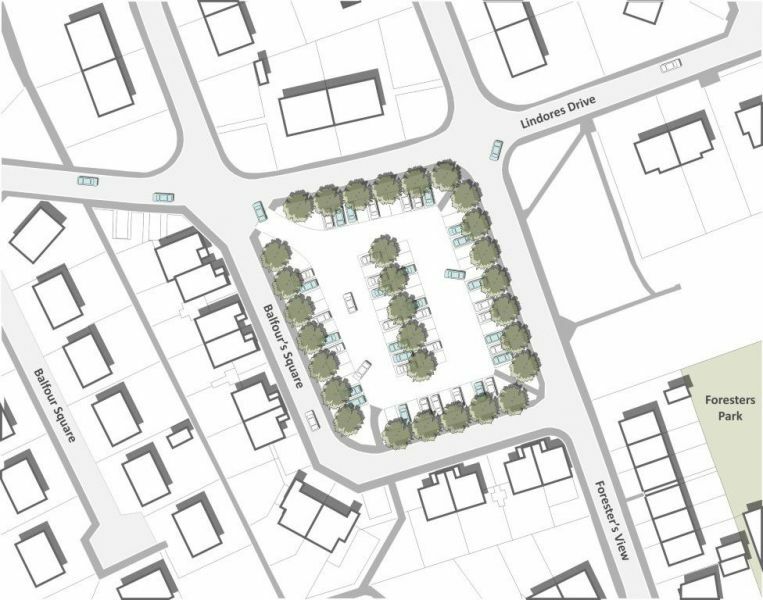 A radical approach to a reconnection would be through realigning Loch Road to bring the frontages of the Loch Centre and Health Centre closer to the street, and create a residential development site that would complete the urban grain of the area. 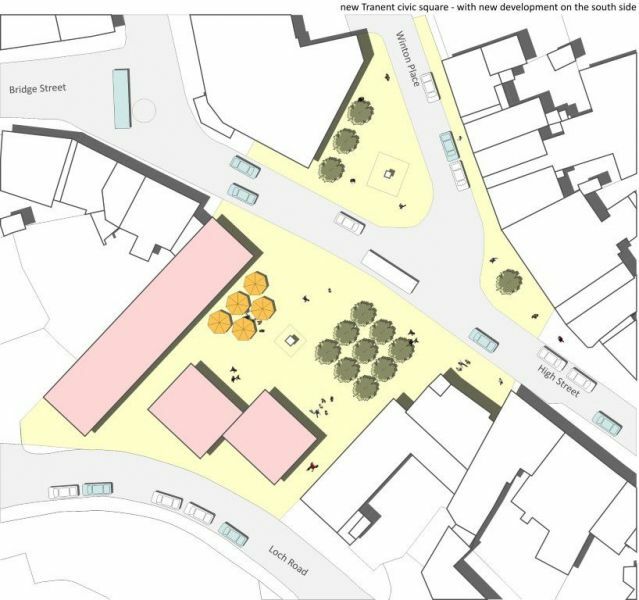 This would be further enhanced with the social spaces outside these and other buildings connecting to improved lanes connecting to High Street. On the north side of High Street, there is an opportunity to claim back space from the rear gardens of properties to create a wider ‘backside’ lane. Widening this lane would improve the feeling of safety with increased sightlines, improved lighting and the opportunity for public art and planting to make this important pedestrian route feel useable. This is particularly significant as this lane connects several car parks to the main street. 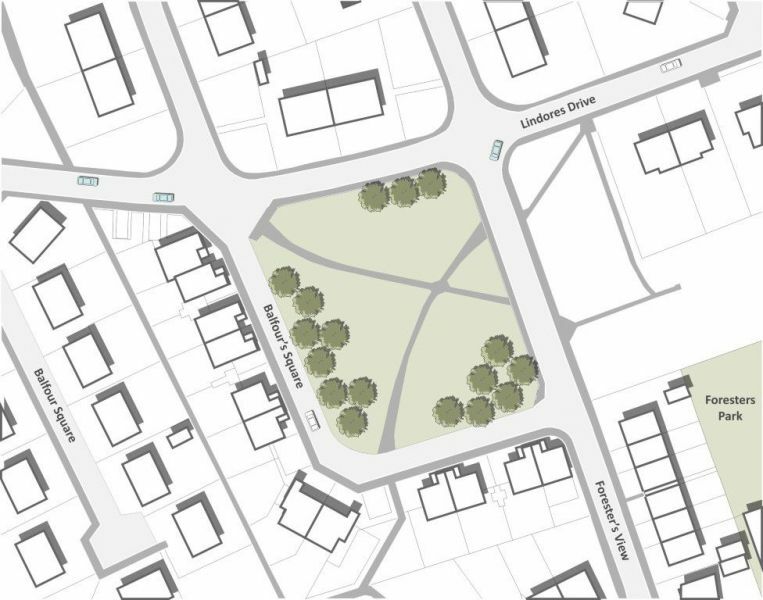 The currently underused greenspace that sits between the George Johnston Centre and the new care home/day centre was recognised as a site that has a number of community-facing facilities and proposed facilities around it. Recreating this space as a park with multiple uses would tie the area together in a more coherent fashion. Uses in the park could include a skate park, community growing spaces and allotments and informal social greenspace. 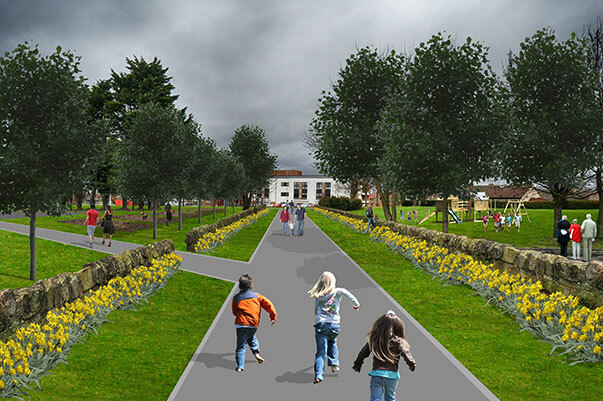 The area of greenspace at Balfour’s Square was identified as an opportunity to create a car park that would serve the town centre with a connection through the ‘Backside’ lanes as well as Forester’s Park, the venue for Tranent Juniors Football Club. Physically improving the historic environment includes three key moves. 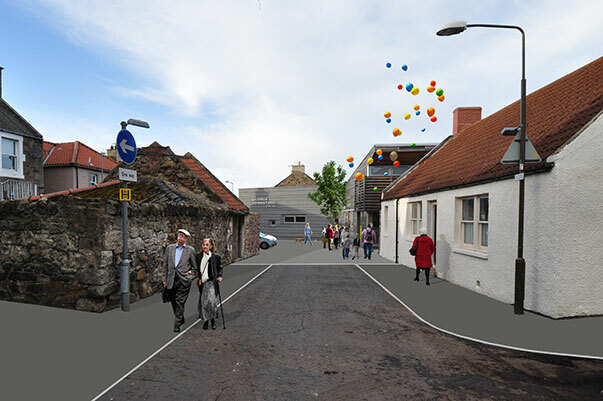 The first is to capitalise on the CARS funding that was secured by East Lothian Council for Tranent’s conservation area. The monies could be used for shopfront improvements on High Street, positively changing the feel of the town centre. Secondly the redevelopment of Fa’side Lodge creates an opportunity to recreate some of the historic urban grain in this part of Tranent, with a residential development of 1 – 2 storey scale and a contemporary twist on the architectural type seen in this part of Tranent. The development would be closer to the street, adhering to historic convention in the area. 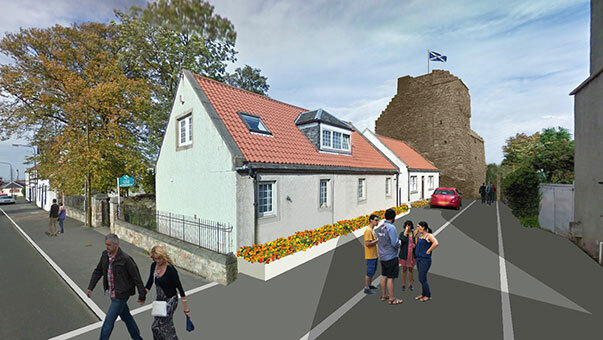 The third move, is the more ambitious restoration of Tranent Tower to act either as a central location for interpretation of Tranent’s story or as tourist accommodation. Access to the tower is complex and could be taken either from Church Street or through Sandersons Wynd, dependent on the final use of the restored property. 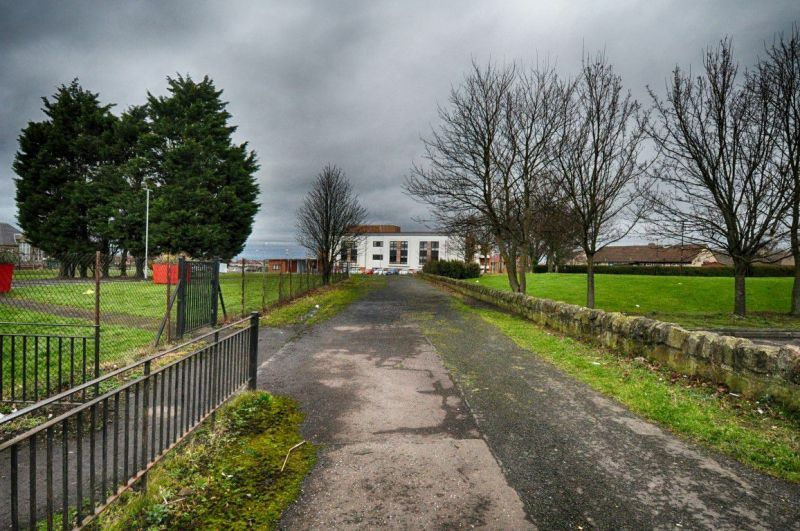 These physical improvements could be complemented with improved interpretation of Tranent’s story particularly the Tranent role played in the period of transition from an agricultural to industrial economy. 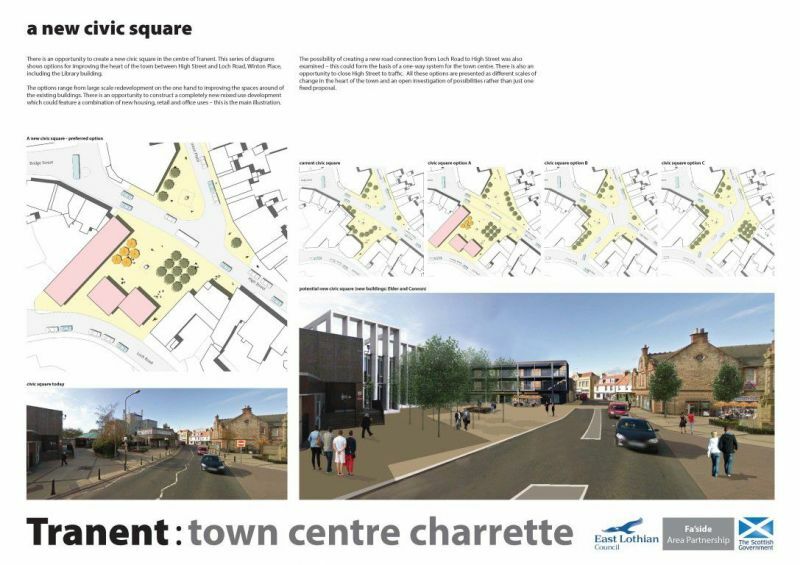 Regarding the economic and town centre use implications, physical changes in the town centre proposed though the charrette process provide a basis for the development of the local town centre economy and a positive shift in how the town centre is used and its user base. Improvements to High Street and the gateway sites at the Ormiston Road junction and Civic Square/Winton Place would signal positive change in the town centre, inviting increased usage and ultimately new businesses or investment in existing ones. 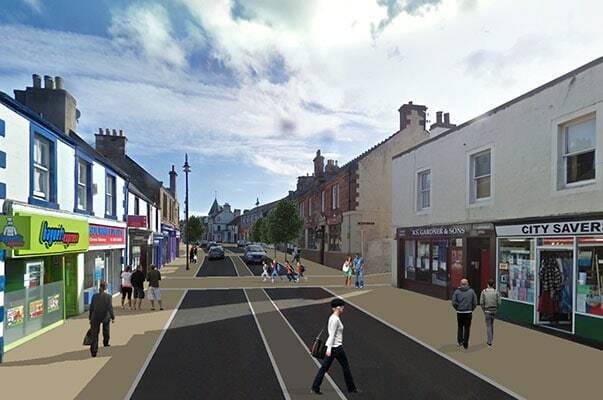 The measures in the regeneration framework are designed to increase footfall for all Tranent residents. Those who currently make the lowest use of the town centre need to be made aware of the planned changes and encouraged to use the town centre more. Additional private investment will not be attracted if existing spend/usage patterns continue. 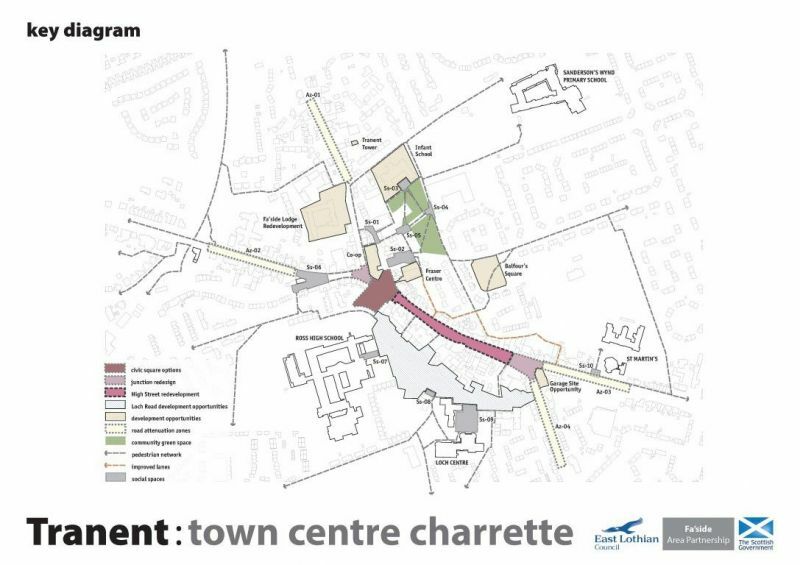 Delivery of the charrette-generated plan will require collaboration between multiple agencies and players and will need to draw from a range of funding sources, with a view to levering the type of private sector investment that will deliver on the strategic vision. There is already a good governance structure in place, with the Tranent town centre working group and the Fa’side Area Partnership. It is therefore envisaged that we simply require a Tranent Town Centre Delivery Team within that structure, that focuses on and co-ordinates the delivery of different elements of the plan as these come forward. In addition to this it may be necessary to establish additional support vehicles for delivery such as a community development trust or a business improvement district that can direct investment locally. There are multiple sources of funding that could be applied for, with many sources specific to project types, such as SUSTRANS funding for active travel projects, or Lottery Funding for heritage and cultural projects. East Lothian Council have already demonstrated success in securing significant funding for Tranent with the Historic Scotland CARS funding package. Deliver on committed projects as funding and/or staffing becomes available, including trial or temporary projects.